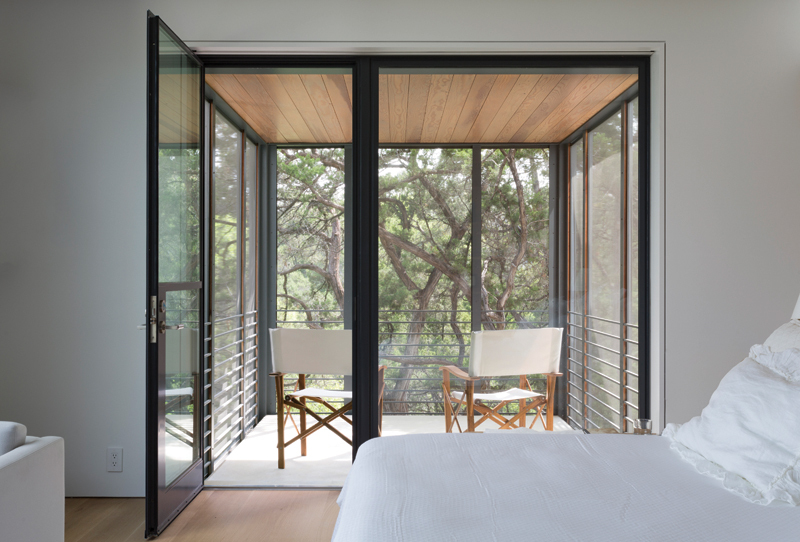 In reviewing the Wildcat Hollow house known as “Hollowcat Wild,” the TxA Design Awards jury noted its material restraint, elegant detailing, and quiet confidence — all commendable achievements of a well-crafted building. More importantly, the jury mentioned the building’s contrasting relationship to the site, an unexpected approach that conceptually underpins the project as a whole. The City of West Lake Hills, located to the west of Austin, is situated in an area of densely rolling hills and winding roads. 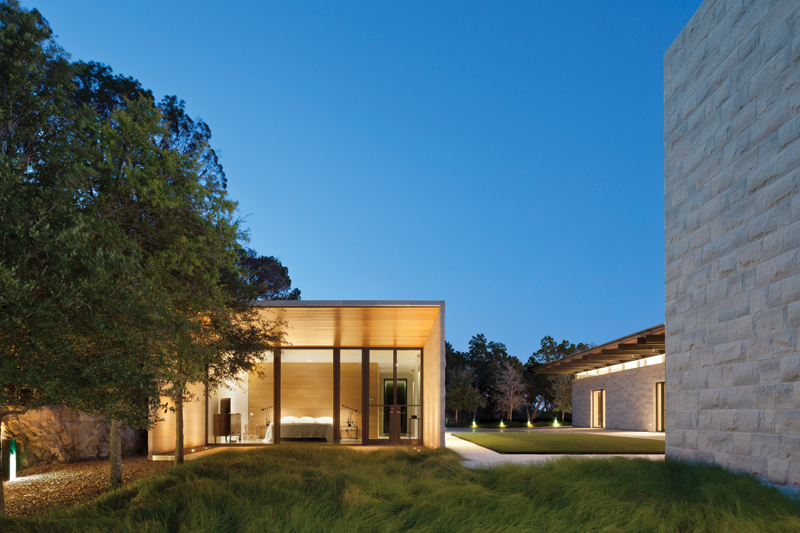 The picturesque box canyons and dense woods, punctuated by spectacular views, have made this affluent suburb a popular place to build for those looking for a wilder setting and retreat from Austin’s growing urban intensity. Wildcat Hollow Road winds up from the lake along the edge of a densely wooded and very steep hillside. The approach to the house is from above. Turning off the road, you abruptly descend the driveway to a surprisingly empty central courtyard space. Mostly hardscape for circulation and parking, the courtyard feels utilitarian. The only vegetation is a rectangle of grass looking like a constructed placeholder for something green, in the way an architect might shade a green patch on a drawing with a colored pencil, meaning to add something later. Were this a theater set, the green space would be a stand-in for a lawn. Three figurative buildings compose a rectangular frame enclosing the courtyard space, which is open on one side. 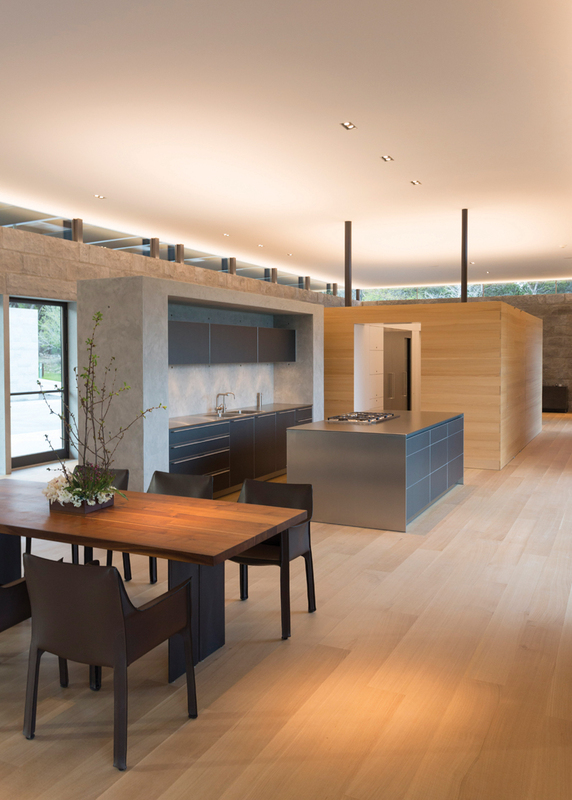 The severity of the courtyard figure, with its penetratingly blank interior, marks the daring spatial contrast to the steep, wild site on which it is located. The emptiness and control of this de Chirico moment detaches from the site. A more probable architectural response would have been to work with the slope; however, this building clearly has other ambitions. The austere courtyard space, benched into the steep slope of the site, could be anywhere, giving the project an anonymity at its core. The lack of spatial transition into the courtyard further heightens the experience of entering it, giving a visitor the feeling that he or she has accidentally stumbled onto a conversation among three characters caught in the middle of an argument. The composition acts as an inverted proscenium, where the three framing buildings contain the personality, and the dialogue is occurring on the perimeter. There is the feeling of a frozen moment where observers are left wondering what the scene was about. The three buildings are familiar to each other, somehow, while containing markers that identify them as clearly separate. Although all are composed of the same exterior Lueders limestone, each has a different roof treatment. The two side buildings are single-story volumes that resemble each other and act as more typical courtyard wall buildings with rational openings that correspond to their functions. The third building, a primary figure at the end of the composition, is more ambiguous. This two-story volume is asymmetrically shifted to the east, downslope, as if it were in the process of exiting the scene, having been distracted from the serious mood by the slope and view. The asymmetry heightens the tension among the buildings and leaves the rigidity of the courtyard frame uncertain. Its one large eye looks directly into the roof overhang of its companion, further emphasizing their tentative relationship. Mell Lawrence is skilled at creating buildings that have a figurative, storybook-like quality. While no less personal and idiosyncratic than his previous works, this new conversation occurs across a tabula rasa at its center giving the project an undeniable questioning and gravity. 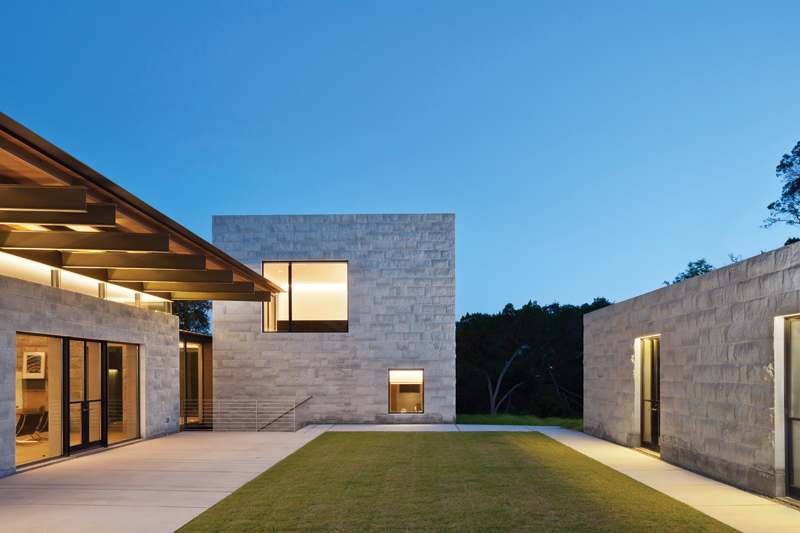 Murray Legge, FAIA, is a principal of Murray Legge Architecture in Austin and a co-founder of Legge Lewis Legge.